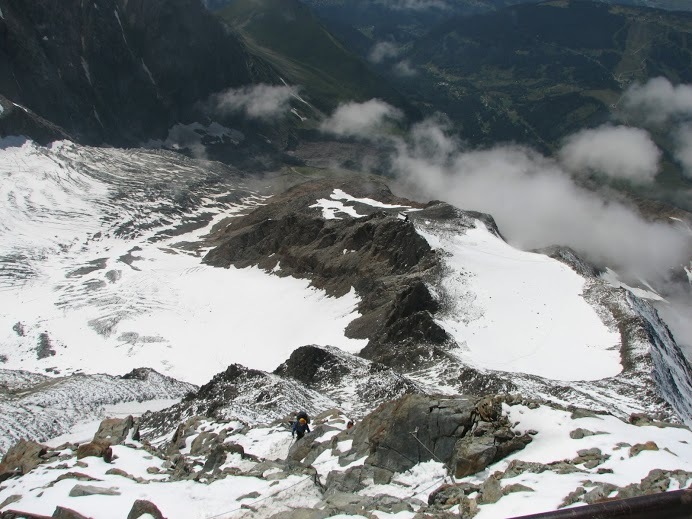 Mont Blanc is certainly one of the most popular climbs in the Alps. No surprise since Mont Blanc is the highest, offers beautiful routes with easy access and it has a reputation of being "technically easy". 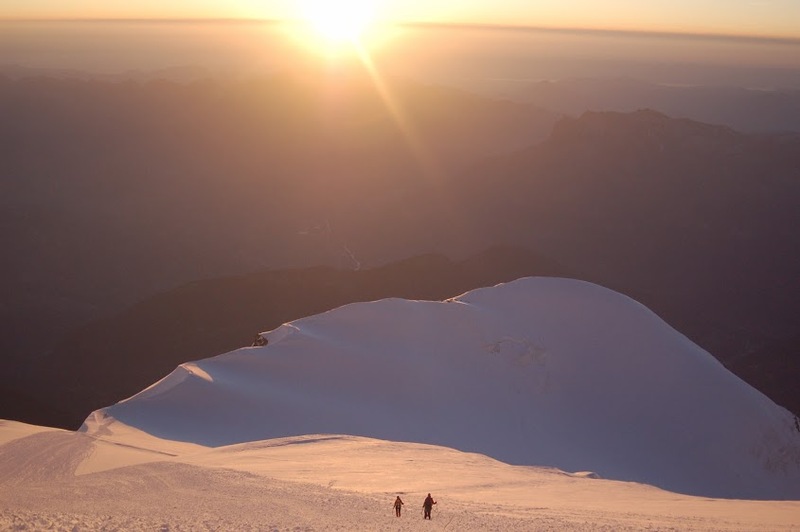 The latter is not really true: Prior experience with crampons and ice axe, excellent endurance and good acclimatization are essential to make the two day ascent a success. Day 1: Cog train ride to Montenvers, descent the steep ladders to the Mer de Glace glacier and spend the day doing technical training using crampons and ice aces. The Mer de Glace offers the best training ground imaginable for glacier training around Chamonix. Return to Chamonix for lodging. Day 2: Meet in Les Houches. Gondola to Bellevue and take a short train ride to Nid D'Aigle. The first three hours of hiking are on an easy trail to the Tete Rousse Hut (3167m = 10400ft) for lodging. Afternoon is reserved to review equipment and do some training in your crampons and relax for the two hard days to come. Day 3: Roping on and early start the ascent to the Gouter Hut. A short glacier is followed by the traverse of the "Grand Couloir", the most notorious and objectively dangerous part of the ascent (45 min). From there it will take about two hours of scrambling, sometimes with support from fixed cables, to reach the Gouter Hut (3800m = 12500ft). We usually drop our backpack and climb a bit higher on tomorrow's ascent route in order to promote acclimatization and get an idea of the terrain that we will travel in the dark the next day. Strong parties could also consider reaching the summit on day 2, especially if the weather indicates deteriorating conditions for the next day. Lodging at the Gouter Hut. Crampons*, climbing harness*, good mountaineering boots suitable for crampons, 1 ski stick, gaiters, warm & weatherproof clothing, hat, gloves, glacier glasses or good sunglasses, sun cream, lip protection, a little energy-rich food, filled thermos or drinking bottle, rucksack. There is a max of 4 persons per group. All participants must be insured for mountain accidents and rescue transport. Please contact us 2-3 days before your date to check the local weather conditions. This gives us the opportunity to postpone or cancel the tour if the weather is too bad. The above expedition is just a guide, contact us at info@expeditioncompany.co.uk to discuss your needs.